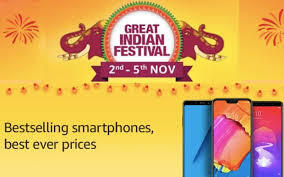 Amazon's Great Indian Festival Sale 2018 has just begun just before Diwali. The 'Diwali special' cell will start from November 2 and run till 5 November. Amazon cell is offering discounts on many other categories of products with smartphones. Apart from this, Amazon has partnered with HDFC Bank for the cell. Use of this bank card will get an extra 10 percent discount. The maximum discount would be Rs 1,500. Amazon Pay users can also get 10 percent cash back. It is known that Flipkart's Big Diwali cell is also underway. It started on November 1 and it will last until November 5. The latest OnePlus 6T smartphone is being obtained exclusively at the e-commerce site Amazon India and OnePlus Store. Its price starts at Rs 37,999. It has been made available with many launch offers. Xiaomi Redmi Y2 4 GB RAM / 64GB storage variant is being sold for Rs. 10,999 with a discount of 2,000 rupees. Apart from this, the old phone exchange will get an additional discount of Rs 1,000. The Samsung Galaxy S9 + handset is being sold for Rs 69,900, while its MRP is Rs 79,000. Samsung Galaxy A8 + has also been cut in price. In the Amazon Great Indian cell, this handset is being sold for Rs 23,990. Vivo V9 Pro has been priced at Rs 17,990, while its MRP is 19,990 rupees. Honor Play's 4 GB RAM / 64 GB storage variant is being sold for Rs. 17,999. Oppo F5's 4 GB RAM model is sold for Rs 16,990. Many Huawei brand's smartphones are also being sold cheaply. Huawei P20 Pro can be purchased at Rs 54,999, P20 Lite for Rs 14,999, Nova 3 for Rs 29,999 and Nova 3i for Rs 17,990. Realme 1 has also been cheaper. Its 6 GB RAM and 128 GB storage model is being sold for Rs 11,990. Apple's iPad Pro MQDW2HN / A 10.5-inch Wi-Fi Modal is being sold for Rs 40,999. Talk about Amazon's gadgets, Fire TV stick will cost Rs 3,499, Kindle Paperwhite Rs 8,799, Kindle Rs 4,799, Echo Dot (2nd gen) Rs 2,449, Echo Dot (3rd gen) Rs 2,999, Echo Spot 10,999 The rupees and the Amazon Echo can be bought at Rs 6,999.